Saddlewood Condos are ski in ski out townhomes in Breckenridge CO Real Estate. Located on the Snowflake Lift ski back and 3 blocks to Breckenridge’s Main Street, Saddlewood Condos are in an ideal location. Built in 1999 there are a total of 36 Saddlewood Condos comprised of 2 – 1 bedrooms, 32 – 3 bedrooms and 2 – 4 bedroom townhomes ranging from 808 – 2183 square feet. The majority of the 3 bedroom townhome layouts have a 2nd living room downstairs making these exceptional for families looking for more space. All of these Breckenridge townhomes (except the 1 bedrooms) come with a 1-car garage but they also have surface parking in front of the garage. 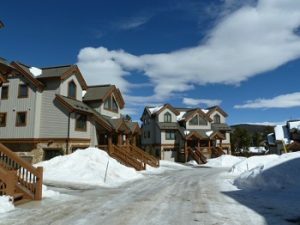 While the majority of the Saddlewood Condos back to the Snowflake ski run the ones that don’t are just a couple hundred feet from the trail making accessibility to the Breckenridge Ski Resort effortless. The townhomes are nicely appointed with wood floors in the living area and kitchen, granite countertops and decent sized bedrooms. Looking for a ski in ski out property in Breckenridge Real Estate, take a look at Saddlewood Condos you won’t be disappointed.